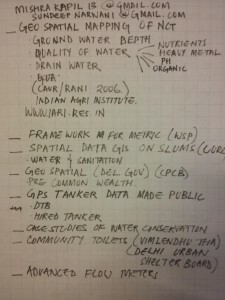 A DataMeet-Up was held on Thursday, April 30, 2015, at the Akvo office to discuss the Summer Action Plan prepared by the Delhi Jal Board (DJB) and the data concerns thereof. Sundeep Narwani of Delhi Dialogue Commission presented the Action Plan. Kapil Mishra, MLA and Vice-Chairman of DJB, participated in the discussions and described the planned activities at DJB. Here are the minutes of the meeting, prepared by Sandeep Mertia. They have planned several measures for improving the systems of – tube wells, infrastructure (replacing old lines) and repairs, grievance redressal and sewage treatment. The details are available in the Summer Action Plan document. 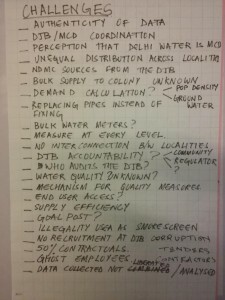 What is the authenticity of data which DJB has? 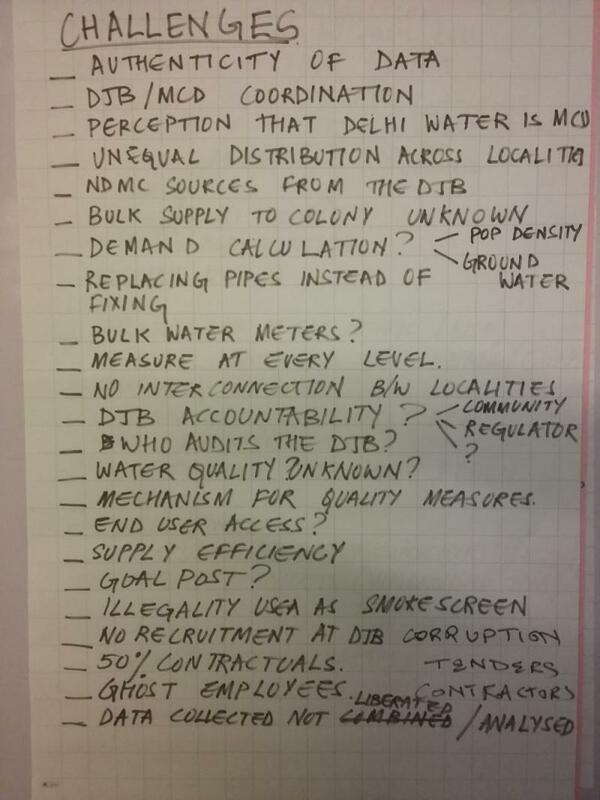 What’s the organisational structure of DJB, and its relationship with the MCD? Mr. Kapil Mishra, the Vice-Chairman of the DJB spoke at length about how they plan to transform the DJB. Also, he promised all data sharing from DJB’s side. After a general discussion on various water related issues in Delhi, in the last segment we focused on framing the data problems associated with SAP 2015. 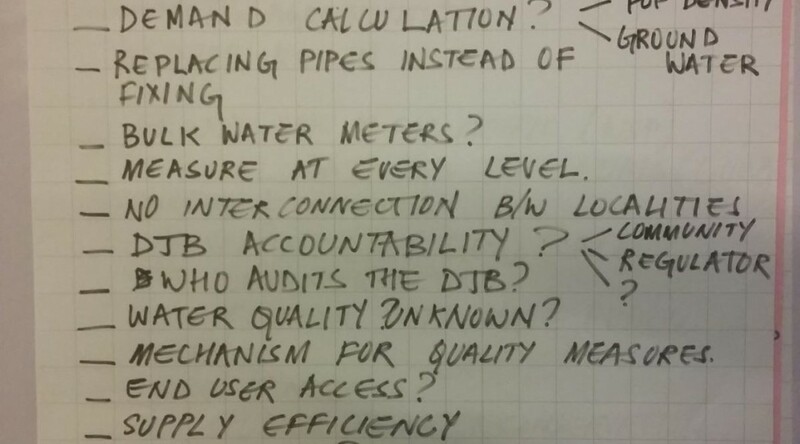 Need to think about the water data which already exists. Need to interpret and understand the data which DJB requires. We are using a Google spreadsheet to list out all data sets that informed the Summer Action Plan. We are using HackPad to collect various resources. After a long hiatus, we had a DataMeet-Up in Delhi on Friday, July 31. Thanks to the Centre for Internet and Society for hosting us. 1. 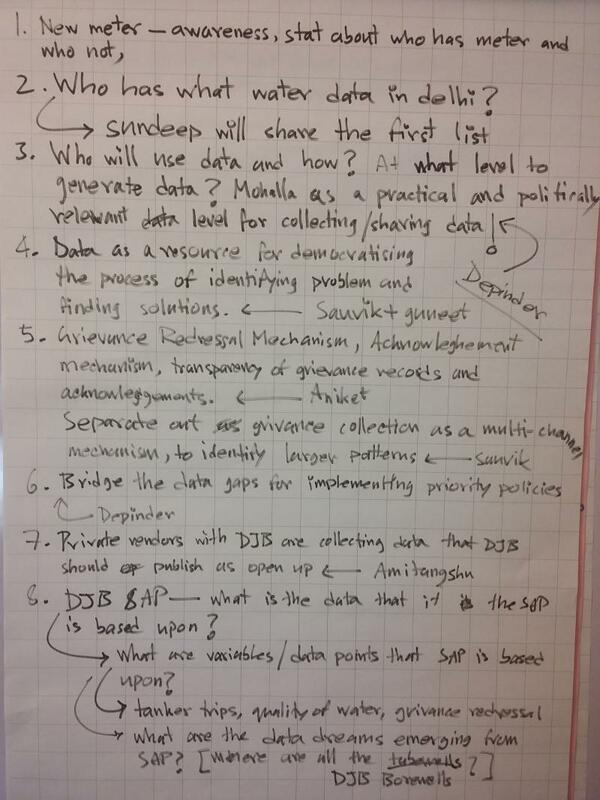 Data Liberartion Strategy: We can work towards creating a strategy and workflow to undertake data liberation tasks. These tasks can focus on two types of data – (1) data that is not available in public yet and needs to be brought out by requesting the authorities concerned and/or speaking to them about it, and (2) data that is available in public but not in an open / directly-usable / machine-readable manner. We of course have done some work towards especially the second type of data, such as with MP constituency boundaries shapefile and with scraping of weather data. It will be useful to prepare and document strategies for such tasks. Deeptanshu suggested that an important available-but-not-machine-readable data that we can work with in near future is the proceedings of the parliament published in the parliament’s website. We can possibly speak to ADR and PRS if they have done any work towards converting that data to machine-readable formats. 2. Learning and Sharing: We felt that DataMeet should undertake pedagogic functions – from internal training / sharing sessions within the DataMeet members, to public workshops for data and visualisation tools and techniques, to online documentation of the same. It seems that the existing (regular or otherwise) members of Delhi chapter of DataMeet is a good mix of those who look forward to pick up data / visualisation / programming skills and those who can offer to teach that. 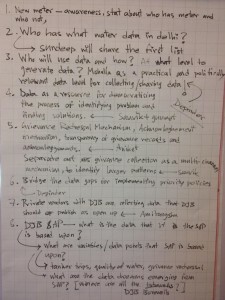 Often the latter group looks forward to learn about available datasets, ways of interpreting government data (from NSSO to budget sheets), and legal considerations associated with data — all of this the former group (who wants to learn data / visuaisation / programming skills) can offer to help with. Hence it make a lot of sense to convert our monthly meet-ups into short learning and sharing sessions. Further, we can document the learning and sharing taking place in the meet-ups and put it up as online references. This will slowly create a knowledge base, with contributions from across the city chapters. There was a short discussion if we should use a Wiki to create such a knowledge base or a WordPress blog. The programming group is more comfortable with the former, while the non-programming group is more comfortable with the latter. With WordPress providing detailed ‘edit history,’ I guess it is alright to use WordPress for the sake of general ease of use. Let us start the documentation over the next 3-4 meet-ups and think of what is the best way to upload it – either as a section of DataMeet blog / wiki / github or a sub-site. 3. 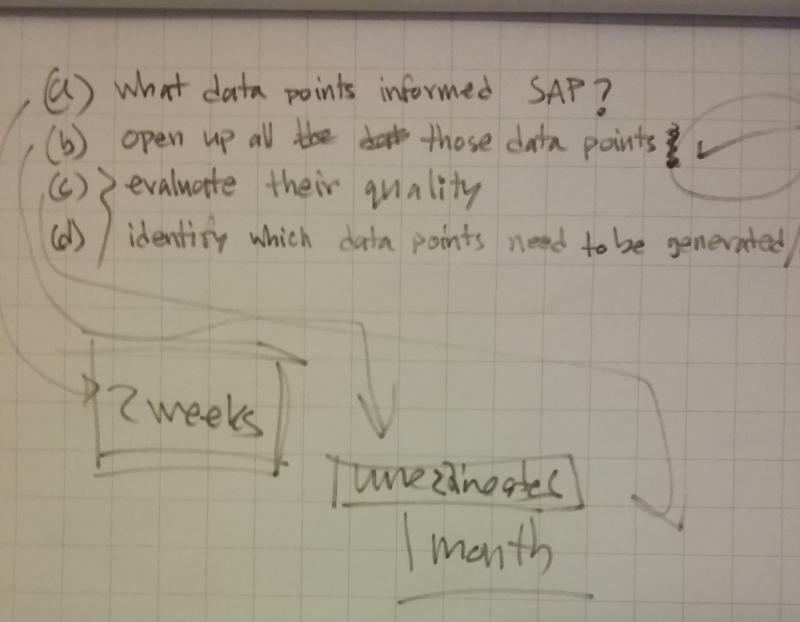 DataMeet-Ups as Tiny Hackathons: It was suggested that on each DataMeet-Up, we take up a particular task — either of data liberation or of data visualisation — and focus on a particular topic and dataset, and spend time together working on the task. This will include thinking about the task, creating a workflow, sharing the skills concerned, and doing the task. And finally we showcase the work done through the DataMeet blog and elsewhere. Further, this will also produce visible evidence of the government data made available at the portal being actually used, and thus to raise awareness of the available data and its demand. 4. Legal and Policy Discussion: It was briefly mentioned that some members of the group often face questions related to legal and policy context of open government data, and also regarding opening of non-governmental data. We should look for resource persons and organisations to advise on such issues. The DataMeet mailing list can also function as a primary discussion space for these topics. However, the mailing list can be too public a space for certain discussions. We had an initial chat about organising the Open Data Camp in Delhi in November 2014. The date and venue discussion is pending. We will take that up in the next DataMeet-Up. The two primary objectives of the Open Data Camp Delhi are (1) a social and networking event for open data people (who are talking about and/or working with open data ) in Delhi, and (2) learn about their interests and challenges and prepare the road plan for Delhi chapter of DataMeet. 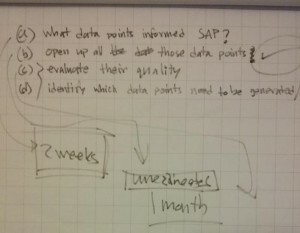 Clearly, the first objective is more community-facing, and the second one is DataMeet-facing. It was suggested that lightning talks should be chosen as a combination of directly selected (by organisers) and community selected (through a submission and voting mechanism) modes. We planned the next Delhi DataMeet-Up to take place on Wednesday, August 27, afternoon, where we will work on visualising datasets related to budget 2014. Rohith from CBGA, and his colleagues, will help us select the datasets and interpret them. The venue is yet to be decided. Possible options are Akvo, CKS, Sarai, and Youth Ki Awaaz. Maybe CBGA can host it too. Further, this also works as a warm-up session towards the Hack the Budget event being organised by World Bank in September. 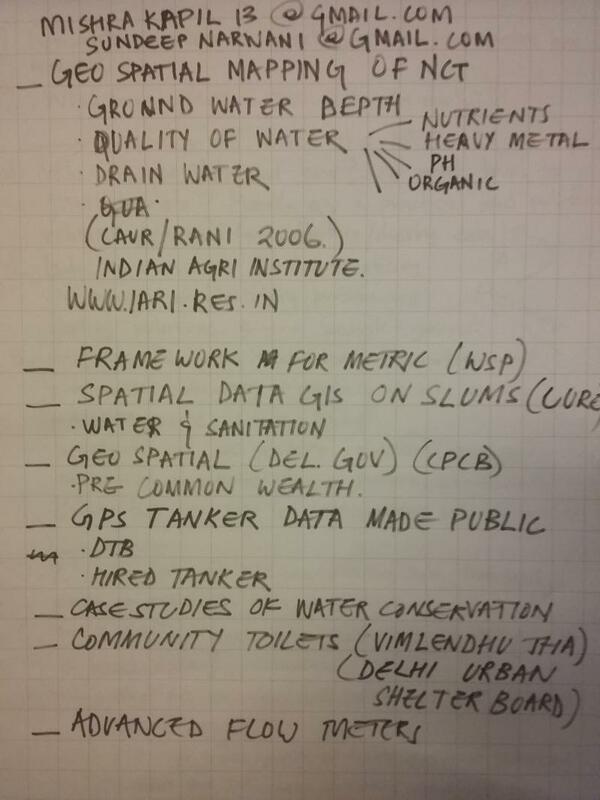 We had DataMeet-Up on Friday, November 22, 2013, at the Akvo office in Yususf Sarai Community Centre, Delhi. We will undertake a collaborative mapping of datasets relevant for election data hackathon, using GitHub and Google Drive. More details about this below. Datasets that we are trying to locate include: election results data (total vote count, vote count per party/candidate, etc), total utilisation and composition of utilisation of MP Local Area Development funds, parliamentary activities of MPs (presence/absence, questions asked, bill discussed, committees joined. etc), crime data corresponding to constituencies, etc. We will identify organisations who might hold additional relevant data, such as PRS Legislative Research, Association for Democratic Reforms (and MyNeta.info), Gramener, and Hindustan Times [Anika used to work at HT]. Two caveats: (1) we may not get unique and standard identifiers across datasets, and (2) calculations may get difficult in case of by-elections [Lok Sabha Secretariat will have details of all by-elections, which can be accessed through RTI request]. Shobha, Breakthrough.tv, led the discussion on the planned Hack for Change event being organised by Breakthrough and Hacks/Hackers, as part of the 16 days of activism against violence against women. The hackathon is organised around urban safety data from Whypoll , multimedia evidences of early marriage practices in Bihar and Jharkhand gathered by Gramvaani , etc. It will also include a Wikipedia Edit-athon facilitated by Noopur Raval. There were multi-directional discussions around other datasets of relevance for the hack event, which I have not kept track of very well. Overall, there were discussions around datasets available from , those published by National Crime Records Bureau, FIR and call database of Delhi police (and how to access that), and data on violence against women gathered by Tata Institute of Social Sciences from police stations across seven states. Konark Modi presented a detailed introduction to using iPython to undertake data cleaning in a very organised manner, as well collaboration features/workflow of iPython. There emerged a demand for a tutorial on OpenRefine (previously Google Refine), which will be organised in a later meeting. We will start documenting publicly available datasets relevant for studying past General Assembly (Lok Sabha) elections in India and the activities of the elected members at present. One can contribute to this mapping exercise in two ways, as mentioned below. GitHub: We have created a repository for this data mapping exercise under the DataMeet organisation at GitHub. The organisation page can be accessed here, and the (india-election-data) repository can be accessed here. In the repository, I have created a draft format for documenting the identified datasets. This draft format can be accessed here. Please feel free to suggest changes to the draft format by opening an issue. To document a dataset, use the format given in the repository, fill up the details, and rename the file according to the dataset’s name, such as “election-results-delhi-1995.md”. Then if you notice any requirement of data cleaning/reorganisation or lack of clarity regarding the dataset, open an issue (where the name of the dataset is mentioned) to note that task. Google Drive spreadsheet: Alternatively, you can access this spreadsheet on Google Drive and add the relevant information about the dataset documented by you. Please comment here or post to the DataMeet mailing list for any clarifications and suggestions.